Diamond Paint & Supply, Inc.
Diamond Paint & Supply, Inc is the premier distributor of professional automotive and industrial finishes in Southwest Louisiana and Southeast Texas. We provide top quality products to our customers which are backed by over 20 years of expertise and customer care. 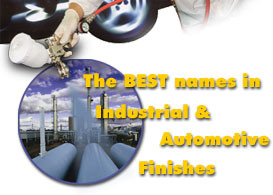 Please contact us if we can help you with your automotive or industrial painting needs. Click on the logos below to go to the manufacturers site. There you will find in-depth information about each manufacturers line of products. Material Safety Data Sheets are also available on most of the sites as well. Copyright © 2000 Diamond Paint & Supply, Inc.